All Shift SSC MTS Exam Cancelled after Question Paper Leak – SSC Multi Tasking Exam cancelled of All Shift 30 April, 14 May 2017: SSC MTs exam paper along with SSC MTS Solution leaked on Facebook & Whatsapp earlier than actual exam. This happened in both day of four shift with SSC. Leak of Question Paper in SSC exams is not a new thing any more. They are known for scam in SSC Exam Process. SSC MTS All Shift Exam Cancelled after Paper leak. New Computer based online exam will be conducted. Have you appeared at SSC MTS Exam? Not a good news, SSC Multi Tasking Staff examination has been cancelled. The Staff Selection Commission (SSC) organized written test for MTS (Multi Tasking Staff) exam on 30th April and 14th May 2017. 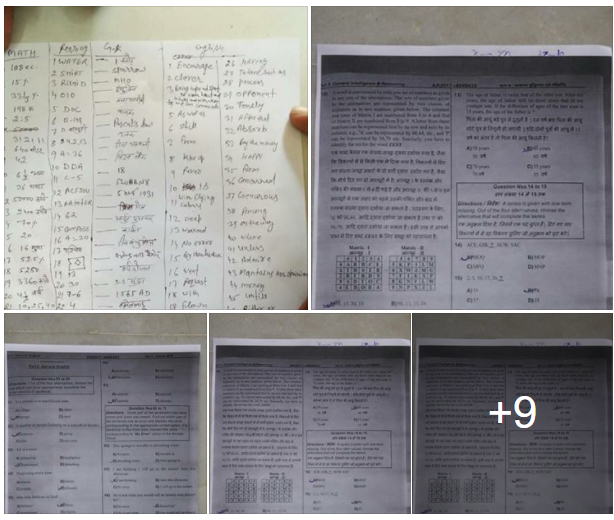 As per the latest sources, SSC MTS’s All shift Exam paper was leaked before the actual exam. Though decision on cancelling SSC MTS exam has been taken by Government of India. News have been spread across the candidates that SSC will be cancelling the MTS (Multi Tasking) Examination due to leakage of question paper at various exam centers. SSC has finally issued official notice about MTS’s Question paper leak, re-examination will be online mode and it will be conducted in September-October. It is being said that some candidates got the actual exam questions which were asked in evening shift of exam earlier than beginning of SSC MTS written exam held on 30 April and 14 May 2017. It's confirmed by SSC, Question Paper were leaked in all shift of SSC MTS Exam held on both 29th April and 14th May 2017. Several post about SSC MTS Question Paper leak along with solution went viral on Whatsapp & Facebook. Check out the Cancellation notice of SSC MTS examination for the various Multi Tasking Staff post in Indian Government.Here is a picture of the leaked question paper. Now confirmation have been made by the Staff Selection Commission (SSC) and investigation is ended up. They got the rumour right that SSC MTS 2016 exam questions paper was leaked much earlier than written examination. This leads to SSC Multi Tasking exam cancellation across the country. So these are the reasons that resulted in re-examination of SSC MTS Exam which was held on 30-04-2017 & 14-05-2017. 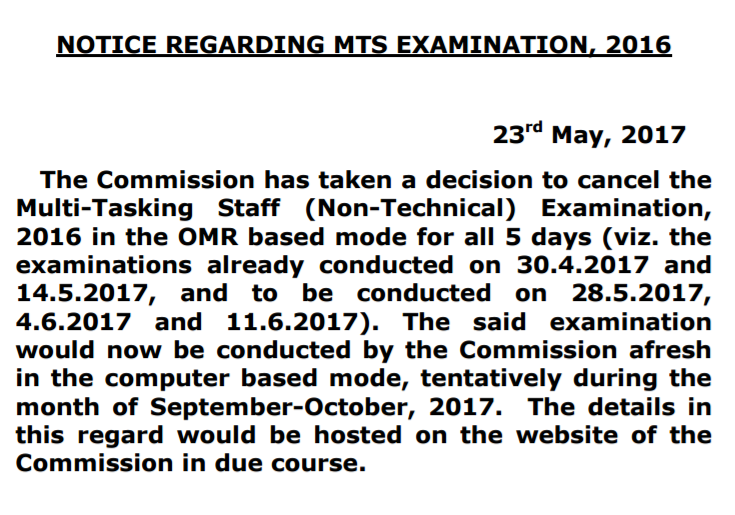 As SSC has decided to conducted re-examination of SSC MTS examination which will be Computer Based Online exam likely to be held in September-October 2017. As of know, Candidates can download official question paper asked in Exam and it's answer key. SSC MTS Question Paper Download.